The concourse, in better times late last year. Now - when I walk through... I feel like I'm going to vomit. The beautiful wall on the south side of the hall is being covered by ad space - lost for the next generation of pedestrians. From now on if I want to get to the WTC, I'm going upstairs and walking into it from outside - for my health. Sigh. The price of phase construction. The concourse was so clean but now that it has opened up to the rest of the site and the ongoing construction in and around it (not to mention the increased foot traffic and the ongoing construction of the last two PATH platforms) the dirt, dust and grime is beginning to wreak havoc. Let's hope maintenance crews are as effective as the design is beautiful. 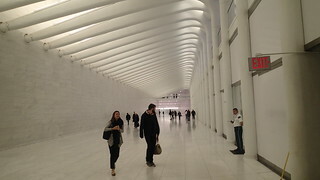 Popped into the WTC Oculus again on Thursday - I couldn't bear to see the defaced corridor between the Oculus and the WTC, but the Oculus itself looks fantastic now that all of the entrances are open, and the stores are starting to unshutter (new Apple store and other commercial locations were open - food/restaurant spaces were still in progress). The view when you walk in and stand at the ground level balcony, looking down into the Oculus... its magical. There's a concerning amount of water damage in the East-West Connector, above the escalators. Is the Hudson trying to break through, again? ^That looks more like what's also going on with the Hudson yards 7 station. It seems no one knows how to waterproof anything anymore..
A quarter-mile stretch of Greenwich Street disappeared from the map of Lower Manhattan in 1967, then from the face of New York on Sept. 11, 2001. Now, it is reappearing as an important boulevard. 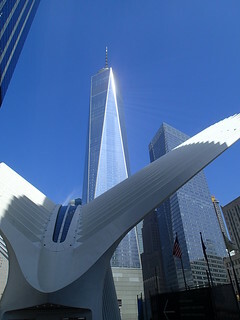 Three of the four World Trade Center towers have their entrances on it, as does Santiago Calatrava’s Oculus, which is the Westfield shopping mall and the trade center transit hub. Mr. Calatrava’s St. Nicholas National Shrine is taking form in the elevated Liberty Park, reached by a broad staircase from Greenwich Street. Diners overlook the street from the recently opened Eataly. The future of Greenwich Street includes a performing arts center in 2020, named for and bankrolled in part by the billionaire businessman Ronald O. Perelman. That will stand opposite 2 World Trade Center, to begin construction when the developer Larry A. Silverstein finds a major tenant. The Cortlandt Street subway station on the No. 1 line, damaged in the 2001 terrorist attack and closed since then, should reopen in two years, with entrances on Greenwich Street. Greenwich Street is also where the last unresolved battle over the future of the World Trade Center is being fought. 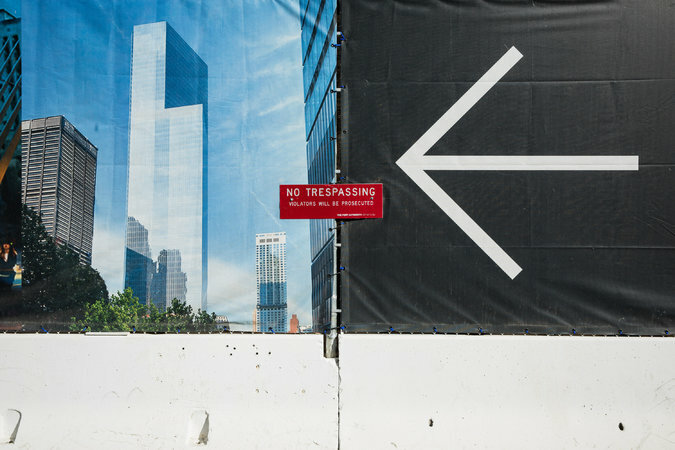 The city and the Lower Manhattan Development Corporation favor the construction of housing on a parcel known as Site 5, where the Deutsche Bank building stood. The Port Authority of New York and New Jersey believes the site should to be used for offices, a conference center and a hotel. All this activity is occurring along a roadway that dates to the early 1700s, when a route was carved along the Hudson River from the southern tip of Manhattan Island to the village of Greenwich, about two miles north. New York City swallowed up Greenwich Village. Landfill separated shoreline and roadway. But Greenwich Street kept its name and its role as a north-south thoroughfare, until the first World Trade Center came along. Parts of Greenwich, Fulton, Cortlandt, Dey and Washington Streets were closed a half century ago to create the 16-acre superblock on which the center was constructed. Greenwich Street was further cut off by the 7 World Trade Center tower and a Consolidated Edison substation immediately north of the superblock. Critics deplored the trade center’s insular nature. No one imagined there would be a chance to rethink it. Once presented with the opportunity, however, many planners agreed that streets should crisscross the site again and knit the new trade center into the fabric of its surroundings. Greenwich Street was the test case. 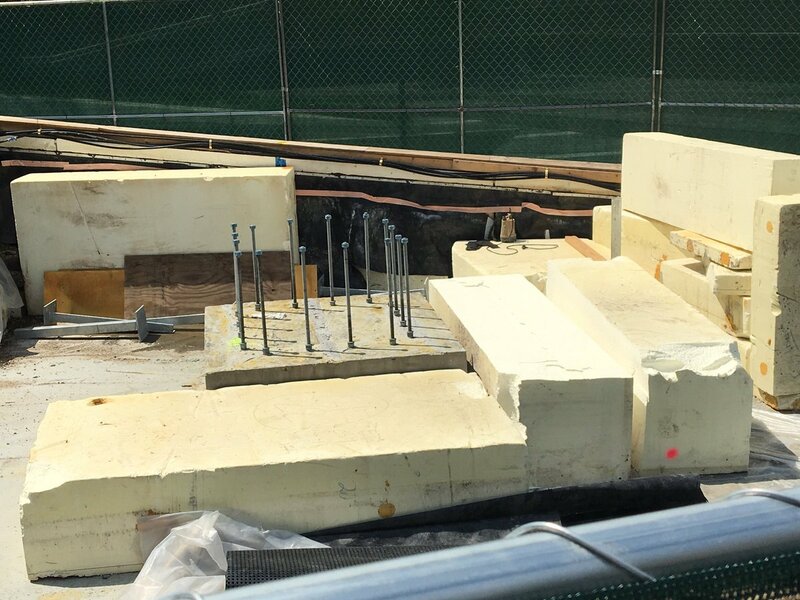 It was vital to the recovery of downtown that the electrical substation be rebuilt quickly. That drove the timing of office tower No. 7, ahead of the rest of the trade center. David M. Childs of Skidmore, Owings & Merrill, the architects of the tower, understood that if the new building could be squeezed in a way that would accommodate Greenwich Street, a helpful precedent could be set for the larger project. This was the subject of my first Building Blocks column (then called Blocks) in 2002. As it has emerged since then, the new Greenwich Street is largely traffic free. Security barriers limit it to authorized vehicles. It functions as a pedestrian zone but feels like an eerily and inexplicably abandoned thoroughfare, since the paving is neatly stenciled with lanes, turning arrows and crosswalks. Yet it also offers a jumble of incongruous impressions, as the best city streets do. 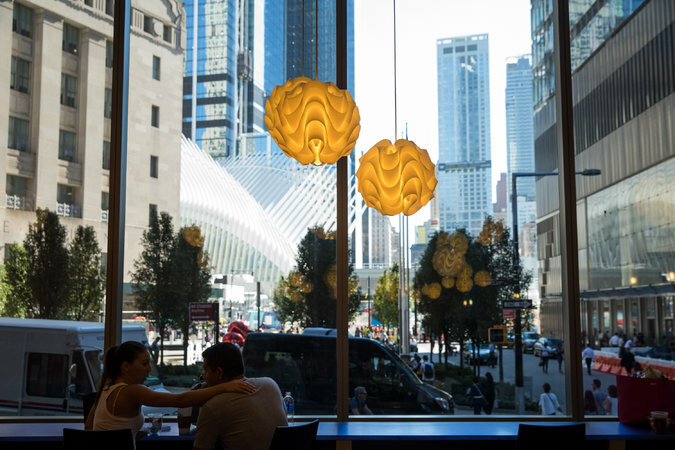 A cafe in the new Fiterman Hall of the Borough of Manhattan Community College, at Barclay Street, overlooks an urbane, little private park at 7 World Trade Center, with a balloon sculpture by Jeff Koons. The cosmopolitan tone set by the park and cafe is broken by a welter of security obstacles at Vesey Street, where Greenwich Street turns into a pedestrian chute squeezed between ventilating equipment for the transportation hub and the abandoned former PATH station. 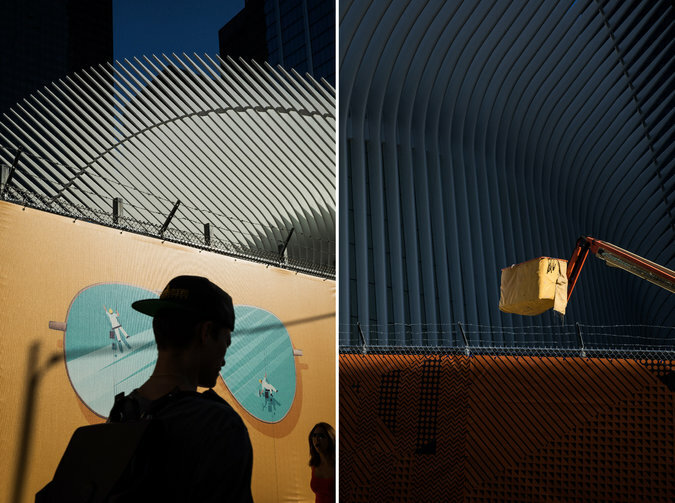 At Fulton Street, the Oculus spreads its enormous wings. To the west, a dense grove of swamp white oak trees and a silvery polygonal pavilion mark the National September 11 Memorial and Museum. Opposite the south memorial pool are Mr. Silverstein’s 3 World Trade Center, under construction and 28 percent leased, and 4 World Trade Center, which opened last year and is now 80 percent leased. At Liberty Street are the quarters of Engine Company 10 and Ladder Company 10, with a bronze relief dedicated to the 343 firefighters who were killed on Sept. 11. Nearby, table tennis players are drawn to the Albany Street Plaza, maintained by the Alliance for Downtown New York and the Lower Manhattan Development Corporation. This is part of the contested Site 5. Flaws and all, it feels as if the connections are taking hold. And given how this column began 14 years ago, that is as good a note as any on which to bring it to an end. I disagree with you wholeheartedly...While the Jersey "faction" (your word not mine), may be the only ones posting lately, they certainly didn't push anyone away. Their posting has neither increased or decreased, just more noticeable now with the lack of NY posts. A few of the most prolific NY members DID die (or did to us), and a lot of us that still remain mostly just lurk now. I also have no problems linking images properly, and my space bar works just fine in the reply box. Thank you Edward for keeping the site up. everything has its ups and downs! With my back to the sun, I got the opposite effect on the Gehry tower. I'll post those in the appropriate thread. NEW YORK (CBSNewYork) — A significant artifact from the original World Trade Center is expected to return to the area next week. The 25-ton, bronze Koenig Sphere is moving from its temporary location in Battery Park to the New Liberty Park, just south of the World Trade Center. The installation is expected next week. 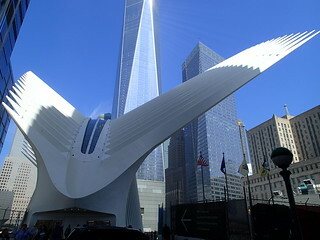 Initially, the sculpture stood between the Twin Towers as a symbol of world peace. It somehow survived the 9/11 terror attacks, and emerged from the rubble only with a large gash. After that it was moved to Battery Park, where it became a monument, and a symbol of strength and perseverance. “When the cloud disappeared, when it lifted, there was a sphere; battered and torn, but still standing,” said Michael Burke, who lost his fire captain brother in the attacks and fought for years to have the sphere returned to the World Trade Center site. 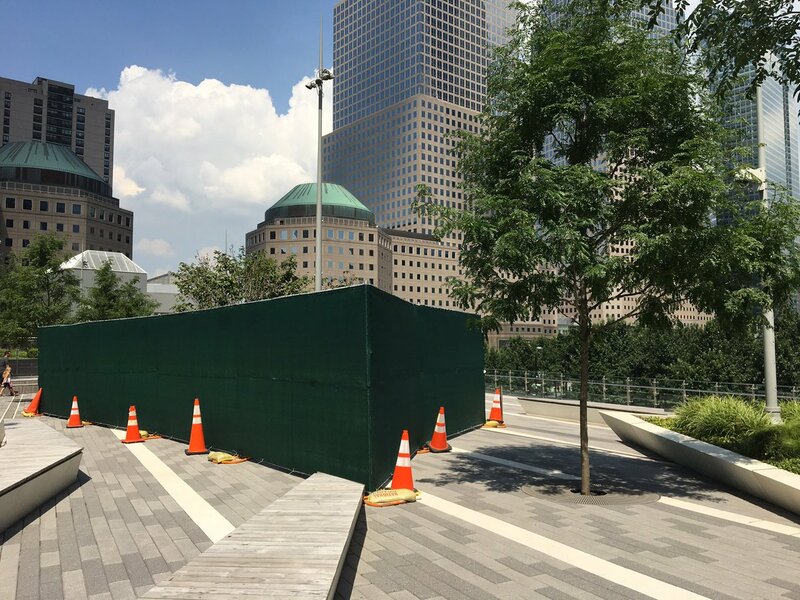 Burke wanted the sphere directly on the 9/11 memorial plaza, but the Port Authority said it can’t do that because the museum operator opposes it and has final say on how to use the space. German artist Fritz Koening created the work. 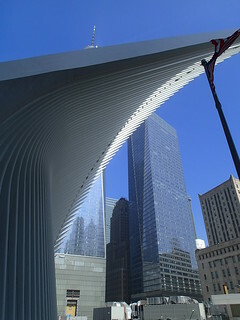 It was installed at the old World Trade Center plaza when the towers opened in 1971, around a ring of fountains. 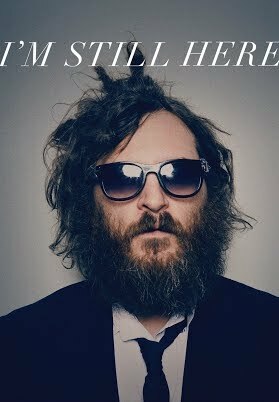 ©2017 CBS Broadcasting Inc. All Rights Reserved. 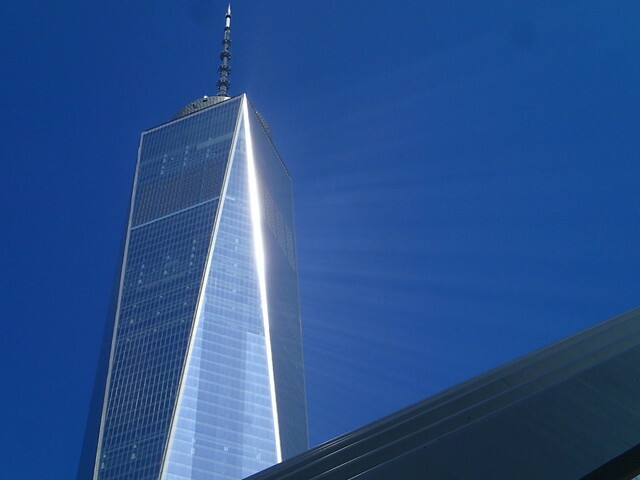 We're about to enter a new era of WTC once the southwest lobby of 3WTC opens. After that, only sites 2, 5, and 6 remain.